Amarok is a powerful music player with an intuitive interface. It makes playing the music you love and discovering new music easier than ever before and it looks good doing it! 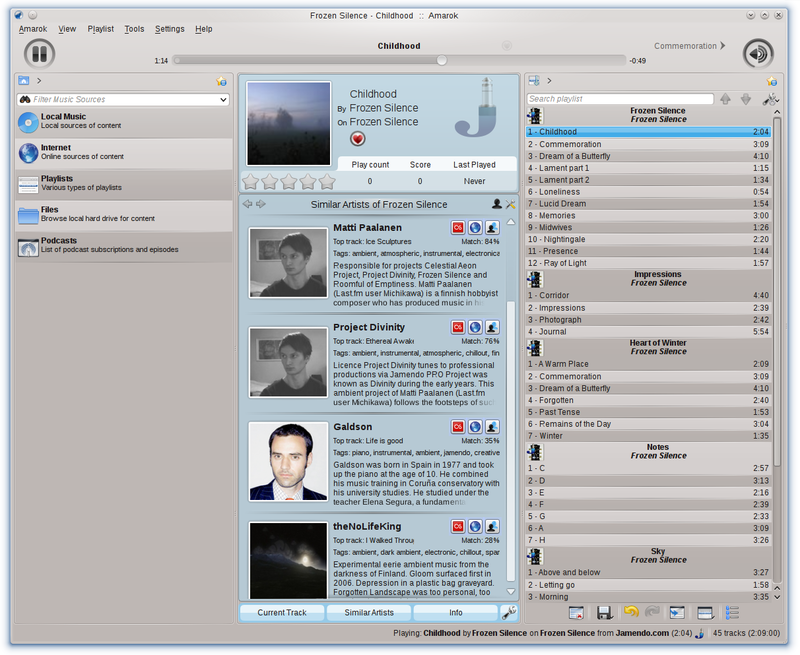 Amarok is based on the powerful Qt4 / KDE4 Platform and nicely integrates with KDE desktop. -- Scripts -- enhance your Amarok experience with community developed scripts. -- Dynamic Playlists -- create playlists that automatically update. -- Context View -- customize interface with the Plasma powered Context View. -- PopUp Dropper -- simplify drag&drop actions with revolutionary menu system. easier with Amarok's powerful tagging, renaming, and sorting abilities. -- Database Importing -- import collections from Amarok 1.4 or iTunes. -- Scriptable Services -- integrate other web services into Amarok. This release brings significant performance, usability, and stability improvements: Most of the bugs involving the context pane have been squished, a completely rewritten collection scanner is presented (hint: it's the thing that reads your music files’ tags) --- Amarok now has the ability to write your statistics and covers directly to the audio files to keep the information across different devices and should detect compilations a lot better. At long last, we also have an option to hide the menu bar again. Speaking of tags, there's a new feature to work along with the rewritten collection scanner: Integration with the MusicBrainz music library to update your songs with accurate information. Having a well organized collection is easier than ever, now that you can select what you want tagged and do it with two clicks. We unfortunately had to remove the Playdar collection again that we added in beta 1. We hope to be able to add it back again as soon as we made a few changes to it. * The ability to use iPod Touch 3G and possibly newer devices. * Transcoding: Now Amarok allows you to convert tracks from one file format to another when copying from the file browser to the local collection. We will expand this to media devices in future releases. * A new applet that fetches guitar and bass tab information for all your string instrument needs. * OPML export for Podcast subscriptions. * Support for UPnP (Universal Plug and Play) collections, you can now listen to music from UPnP servers on the local network. Along with many more features, improvements and innumerable bug fixes. As always, it's good to have a look at the complete Changelog since Amarok 2.3.2 below to make sure you're not missing anything of interest.